In his thoughts, Herman spoke a eulogy for the mouse who had shared a portion of her life with him and who, because of him, had left this earth. "What do they know--all these scholars, all these philosophers, all the leaders of the world--about such as you? They have convinced themselves that man, the worst transgressor of all the species, is the crown of creation. All other creatures were created merely to provide him with food, pelts, to be tormented, exterminated. In relation to them, all people are Nazis; for the animals it is an eternal Treblinka. --Isaac Bashevis Singer, "The Letter Writer"
While in New York doing graduate work at Columbia University, I became close friends with a German Jewish refugee, traumatized by her experience of living under the Nazis for six years. Her story moved me deeply, so I took courses and read extensively to learn more. Yuri Suhl, author of They Fought Back: The Story of the Jewish Resistance in Nazi Europe, and Lucjan Dobroszycki Pinel of the YIVO Institute of Jewish Research, editor of The Chronicle of the Lodz Ghetto, 1941-1944, were especially helpful. Later when I became a history teacher and looked for, but could not find, a book on the background of the Holocaust suitable for my students, I wrote Anti- Semitism: The Road to the Holocaust and Beyond to fill the gap. The summer after its publication I attended the Yad Vashem Institute for Holocaust Education in Jerusalem, where I learned more from Yehuda Bauer, David Bankier, Robert Wistrich, and other Holocaust scholars. Back in the United States, I began reviewing books for Martyrdom and Resistance, a bimonthly now published by the International Society of Yad Vashem. My awareness of the scope of our society's exploitation and slaughter of animals has been a more recent development. I grew up and spent most of my adult life oblivious to the extent to which our society is built on institutionalized violence against animals. For a long time it never occurred to me to challenge or even question the practice or the attitude behind it. The late AIDS and animal activist Steven Simmons described the attitude: "Animals are innocent casualties of the world view that asserts that some lives are more valuable than others, that the powerful are entitled to exploit the powerless, and that the weak must be sacrificed for the greater good." Once I realized this was the same attitude behind the Holocaust, I began to see the connections that are the subject of this book. I am dedicating the book to the great Yiddish writer Isaac Bashevis Singer (1904-91), who was the first major writer to focus on the "Nazi" way we treat animals. 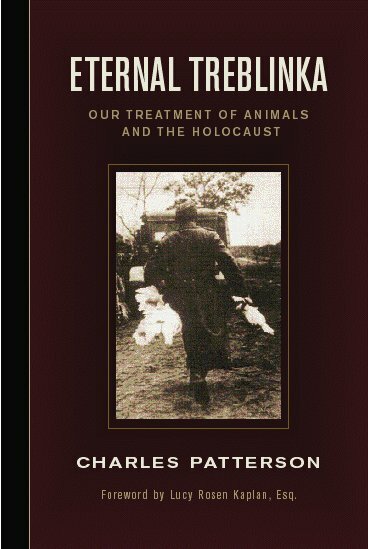 The first two parts of the book (Chapters 1-5) put the issue in historical perspective, while the last part (Chapters 6-8) profiles people--Jewish and German--whose animal advocacy has been, at least to some extent, shaped by the Holocaust. The conviction of Albert Camus that "it is a writer's responsibility to speak for those who cannot speak for themselves" helped me persevere through the writing of this book. And when it looked as if I might never find a publisher brave enough to publish it (some said the book was "too strong"), I took comfort from Franz Kafka's view: "I think we ought to read only books that bite and sting us. If the book we are reading doesn't shake us awake like a blow to the skull, why bother reading it in the first place? So it can make us happy? Good God, we'd be just as happy if we had no books at all....A book must be the ax for the frozen sea within us." If the issue of the exploitation and slaughter of animals moves to center stage in the twenty-first century the way the issue of human slavery did in America in the nineteenth century--and I think it will-- my hope is that this book will be in the thick of the debate.